Researchers have discovered that the crust of a neutron star contains the strongest known material in the universe. Neutron stars are among the most exotic structures in the universe. They're what's left over after a massive star exhausts its fuel supply and explodes as a supernova. The remaining material collapses to form an object so dense that the nuclei of atoms — the protons and neutrons — are literally squeezed against each other. This produces an object that weighs twice as much as our Sun, but is compressed into a space smaller than the island of Montreal. Now researchers have discovered that the crust of a neutron star — its uppermost layer — is not only dense but also extremely strong. That's because the nuclear matter in the star forms a complex and very rigid crystalline structure. The nucleii are arranged in highly organized lattice patters, rather like the way carbon atoms are arranged in a diamond. The end result is a material that's not only dense but also extremely resistant to bending or breaking. In fact, it's the strongest known material in the universe, as astrophysicist Matthew Caplan of the McGill Space Institute told Quirks & Quarks. The material in the neutron star "is just incredibly stiff," Caplan said. "That owes to its enormous density; it's something like a hundred trillion times the density of water." And that density, along with its rigid structure, "just makes it very hard to squeeze and twist." Because these structures can resemble long cylinders or flat layers — like spaghetti or lasagna — researchers have taken to calling them "nuclear pasta." Caplan and his colleagues probed the physics of this "pasta" by using a supercomputer to simulate the forces at work inside a neutron star. The simulations required more than two million hours of processor time. On a laptop it would have taken more than 250 years, Caplan said. Although this study only involved simulations, Caplan says that it may be possible to detect the effects of this "nuclear pasta" through its gravitational influence. Because of the rigidity of the star's crust, a neutron star might might have small imperfections on its surface, rather than being perfectly spherical. In other words, neutron stars may have small "mountains" on their surface — structures reaching a height of a few tens of centimetres. Despite their unimpressive height, one of these neutron star mountains would have more mass than the Himalayas. One outcome of this is that as the star spins, the motion of these "mountains" should produce subtle ripples in space-time known as gravitational waves. The signal from these gravitational waves would be quite weak compared to that released by the gravitational wave sources that physicists have recorded so far. 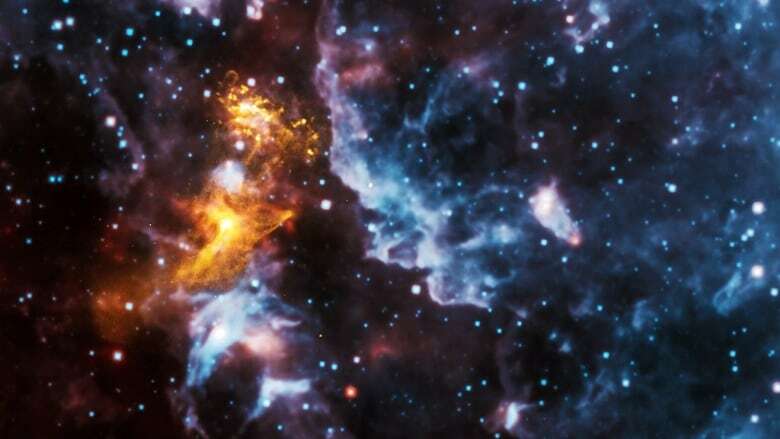 For example, it would be a much smaller signal than what was given off when a pair of neutron stars collided and merged — an event that astronomers successfully recorded earlier this year. Nonetheless, Caplan says that these more elusive signals from spinning neutron stars should eventually be detectable from Earth. The research was published in Physical Review Letters.